Texas is home to over 16,000 historical markers. And now there's an app to help you find them! Features: -Onboard marker database means you can browse markers without an Internet connection. 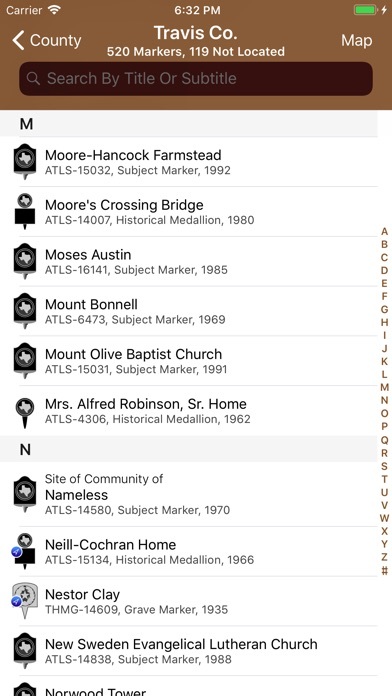 -Browse markers by geographic locations including cities and counties. -Browse markers by type, size, and subject. -Browse attractions where markers can be found including cemeteries; state parks; historic districts; etc. 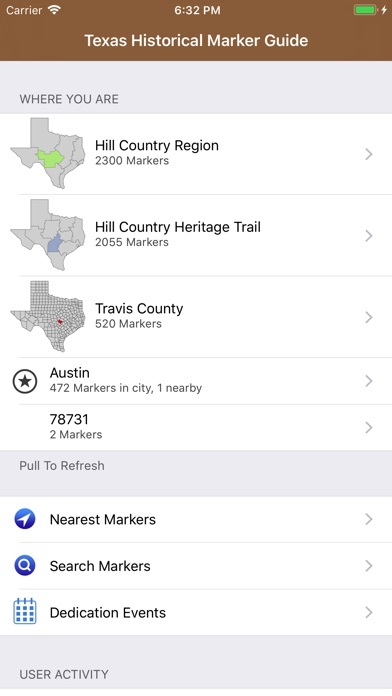 -Uses Location Services in the background (optionally) and notifies you when you enter a different Texas county! (Continuous use of GPS may reduce battery life.) -Keep track of marker visits! -Update marker coordinates! (Device with GPS radio required) -Record marker conditions! -Includes conditions of marker where reported. -Includes text for many markers with more being added frequently. -Take new pictures with in-app camera or link to existing pictures from your Photo Library! (Photos not included with app.) -Share your favorite markers via FaceBook, Mail, and iMessage! -Backup your user database to your computer using iTunes File Sharing. Backed up data includes: Markers you’ve checked in at; marker coordinates you’ve captured; favorite markers; flagged markers; shared markers; and markers you’ve browsed in the database. 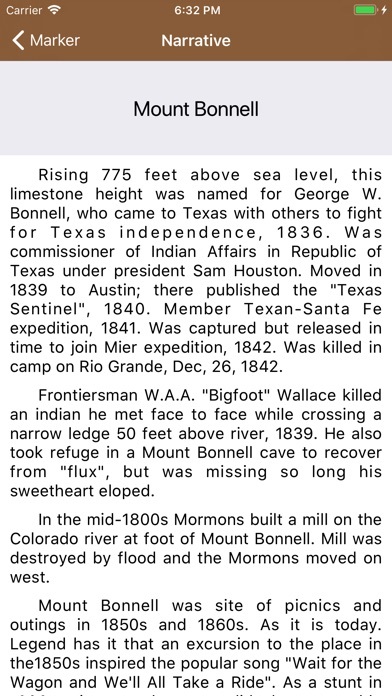 Includes: -Texas Centennial markers and monuments erected in 1936! -Old San Antonio Road markers erected by DAR and the State of Texas in 1918! -San Jacinto Battleground markers erected by DRT and the State of Texas in 1912! -Complete Texas works of Pompeo Coppini! -Selected Texas works of Waldine Tauch, Frank Teich, Elisabet Ney, and others! -Blue Star Memorial markers (all the ones we know about.) -New markers erected since 2012! Whenever on a road trip through Texas I always see the Historical Marker signs. Now I can look them up by the code on the sign and find out what happened in that area. I had been looking for an app like this for a long time. Glad I found it. Drive by site seeing of historical markers, so cool. The best way to find markers in Texas! 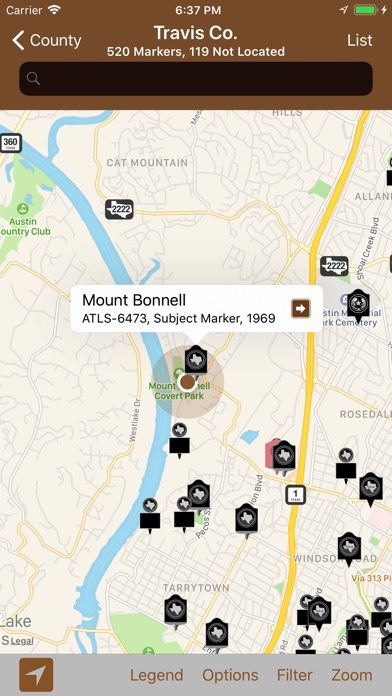 We use the app while traveling around the state and this makes the hunt much easier. Any excuse to get out on the road and see more of the state. Bravo, this is a wonderful tool. Not at all user friendly. Please develop a location tracker that shows all the markers in the location. Having to scroll around a map is a buzz kill. I want to know what’s around me. Not search for map locations. 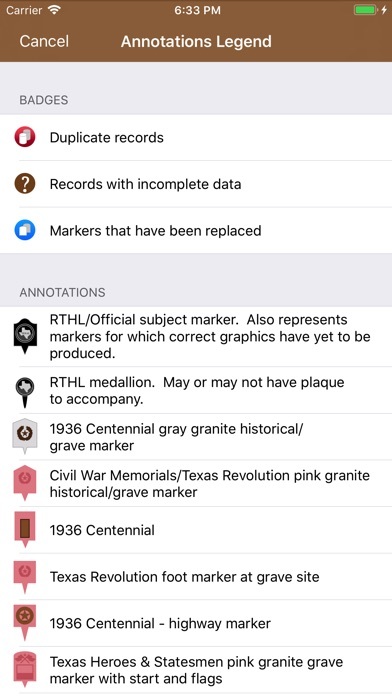 Having the ability to see what the history on the marker is, is nice! A bit slow at times but overall I love this app. Would be a five star app, if you could hear a narrative as you pass by. Can’t drive and read or can’t always stop. Love this app - I used it extensively on a recent road trip. With DH driving, I can search for the number at the bottom of the "marker ahead" signs to see if it's worthy stopping for. I just installed the 11/16 update, and unfortunately the search box is hidden under the top banner and I can't type into it. Pulling the page down just refreshes the data and still doesn't let me type into it. I have an iPhone 5S, iOS 10.3.2. Please fix it before my next road trip and I'll update my review.